Jurassic Park III is a b-monster movie. It is unambitious, filled with stunning special effects, and a project that fits easily alongside other softly received sequels in any given franchise. Not for nothing, but Jurassic Park III might also be the best Jurassic Park sequel. Please don’t leave the web page, yet. Allow me to explain. There’s a much more rip-roaring pace to the whole film, with surprisingly fluid editing transitioning us from our eventual plot setup to catching us up with power couple turned platonic bff’s, Dr. Alan Grant and Ellie Sattler. If there is any one single, indefensible flaw in Jurassic Park III, it’s separating Alan and Ellie as a couple. Not only was their relationship one of the core elements of the story, but the original film and Jurassic Park III don’t clue us in on the factor that caused their separation. By the end of the first Jurassic Park and the start of this one, Alan is comfortably sharing healthy repertoire with multiple tiny humans. It’s not like he’s allergic to them still. Joe Johnston would go on record saying he didn’t think the two belonged together. I love you, Joe Johnston, but I will happily disagree with you on this. What I will agree with Johnston on is his decision to have Alan be a reluctant, grumpy protagonist. This is a man who understands the nature of man’s relationship to the dinosaurs on the islands of Isla Sorna and Isla Nublar. We no longer belong there. The rest of the characters are fine. Serviceable enough to make for compelling dinosaur chow as they quickly meet their grim demises. Any movie that is smart enough to get rid of goofy militaristic goons at such an efficient rate will have my appreciation. The two divorced parents, Paul and Amanda Kirby, are obnoxious middle-class divorcees who are in way over their heads. They’re idiots, but they’re idiots who would do anything to get their stranded child back from a now lost world. Here’s where I have a partial bias towards this movie. My parents divorced when I was six years old. It’s pretty uncommon to even have it mentioned in any capacity in media, let alone one with dinosaurs. As a wide-eyed child whose first movie love was Jurassic Park, seeing something as tangible as divorce represented in the same movie where dinosaurs fight on a deserted island made this the best movie ever made for me. Sadly, it doesn’t pack quite the same punch now that I have a semblance of intelligence, but it’s still appreciated nonetheless. The moments between the family are touching but they leave Alan Grant as too unwilling a participant for the first half. There’s a balance that needed to be struck between his grumpy reluctance before swinging into a grumpy quick-thinker. Maybe more of a parallel between the Kirby’s and his failed relationship to Ellie. You’d have a hard time convincing me it was still in any way the correct direction for the story to go, but at least it could have been mined for drama. That might make it pretty emotionally dour for a summer blockbuster, but as it stands, Jurassic Park 3 is already pretty melancholy. Romantic relationships are broken down. Humanity has walked away in defeat of their ambitious bio-folly. The deaths are quick and relentless within minutes of landing on the island. Alan Grant’s paleontologist partner, Billy, is picked apart by Pteranodons. And yet, a last minute rescue is provided by armed forces, with Billy somehow surviving his encounter with a handful of hungry Pteranodons. It is both a lot and not enough in the span of 90 minutes. Where Jurassic Park 3 truly surpasses anything outside the Spielberg entries is in its action efficiency. Joe Johnston, a student of the same era that birthed Spielberg and George Lucas, stages dino vs. dino action with legitimate weight. The effects only have a few moments that haven’t aged well (oof, that brachiosaur by the river) but for the most part, maintain the same illusionary power as its direct predecessors. Raptors are evolving but still the fiercest creatures on the island. Even the Spinosaurus is pretty intimidating. The survivalist set pieces are influenced by failed technology and the sprawling, endless wildlife that has overtaken the island. The major standout being a cliffside escape in the world’s biggest and weirdest birdcage filled with Pteranodons and their offspring. If that sequence hit theaters today, film twitter would be eating it up. It’s nothing revolutionary, just a quality director playing in the same major sandbox as his almighty cinematic peer. The thing about Jurassic Park 3’s non-ambition, is that at one point it was ambitious. 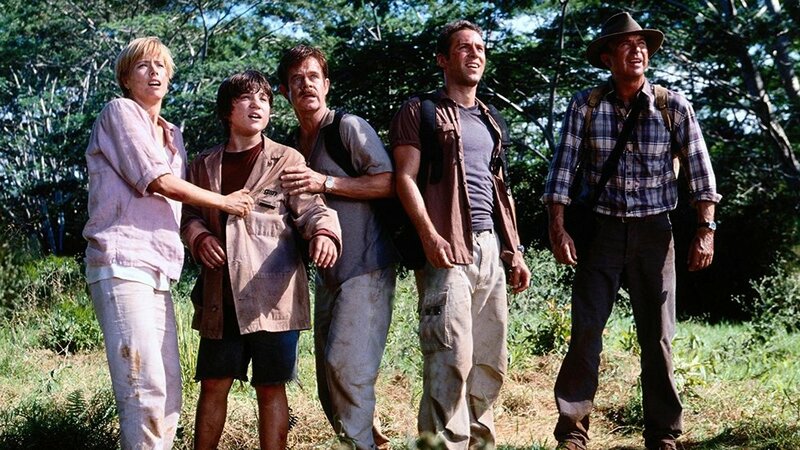 Original script ideas revolved around Dr. Alan Grant secretly relocating himself to Isla Sorna to study the Site B dinosaurs. Another script was about Dr. Grant leading an investigative team to uncover the causes of mysterious killings around Costa Rica. Spoilers: it was migrating Pteranodons. This mirror’s the original ending to Jurassic Park 3, which has also been rumored to be the original ending to Steven Spielberg’s original Jurassic Park. Just replace the pelicans with Pteranodons. We shouldn’t settle for complacency in our franchises, lest they grow stagnant. If someone were to tell me they didn’t enjoy Jurassic Park 3 because it lacks the weight of the first film, who am I to deny them that claim? But in terms of films as efficient on delivering thrills and quality effects, Jurassic Park 3 has an undeniable sturdiness. It’s hardly the greatest third entry of a franchise, but it’s a solid one. Sometimes it’s nice to just have that quality waiting by your television set.